It was a special occasion for the Friends Chess Club Coimbatore, when it celebrated its silver jubilee, by inviting the celebrities GM R. Praggnanandhaa, the world’s second youngest grandmaster and his sibling WGM elect R. Vaishali for the prize distribution function of its state level tournament on 1st & 2nd September 2018. The tournament was held at Krishna Gounder Kalyana Mandapam, Ganapathy, Coimbatore. R. Ganesh, a player from Coimbatore who has represented India in an international event in Moscow was the top seed, followed by trainer K. Dhanasekar, C Mukesh both from Coimbatore and former Asian Amateur champion and fide arbiter T. ShyamSundar from Thanjavur. The first round started with a bang, low rated JR Adhavan of Coimbatore stunning Shyam Sundar. Top seeded Ganesh had to be content with a draw in the fourth round against L Nirmal of Coimbatore. Again, Ganesh was held to a draw by G Aakash of Coimbatore in the next round, leaving Dhanasekar and fifth seeded Meenakshi Sundaram of Coimbatore as joint leaders. 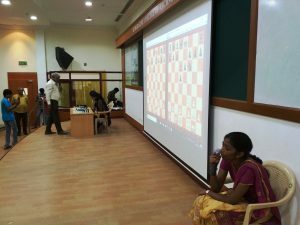 In sixth round meeting between the two leaders, Dhanasekar overcame the stiff resistance from Meenakshi Sundaram to be the only player scoring six points from six games, distancing the opponents by a full point. Though assured of the title with one round to spare, Dhanasekar did not relent and went on to win the final round to score tha maximum possible eight points and won he title. PL Kavitha of Salem daughter of the international arbiter Mr. Palaniappan was the only player to collect eight points to finish runner up. Seven plyers tied for the third place. GM R. Praggnanandhaa and WGM elect R. Vaishali were the cynosure of all eyes, who distributed the prizes to champions. On the first day, they played simultaneous chess with 54 players, losing four and splitting the point with one player. The reason for the four losses were mainly due the tiredness, as they had an exhausting blindfold simultaneous chess with two players each in the morning at Kumaraguru College of Technology. 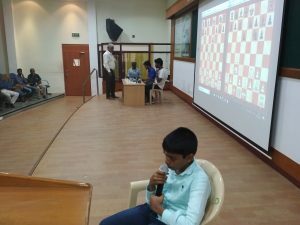 Dr. N. Mahalingam Chess Academy of KCT also hosted a warm welcome to the siblings and there was a lively interaction with the college students and the two star players.